Hurricane Michael struck Florida’s panhandle in October 2018 as a strong Category 4 storm, with sustained winds of 155 miles per hour. At least 29 people in Florida died in the storm or its aftermath and another 10 people in Georgia, North Carolina, and Virginia, as of this recording. Beyond the cost in human lives, is the cost of rebuilding homes, businesses, and infrastructure. Estimates of insured losses alone are between $6 billion to $10 billion. Just how well did Florida’s building codes, both old and new, hold up against the devastating winds – and what’s needed in post-hurricane mitigation as Florida rebuilds? 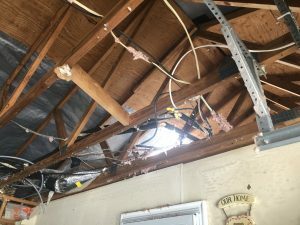 Host Lisa Miller, a former deputy insurance commissioner, talks with two catastrophe adjusters on the ground with Michael’s damages and the head of a consumer insurance group that’s fighting for stronger building codes in the Sunshine State. 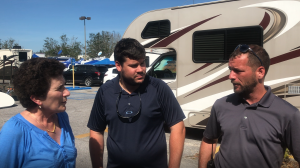 Catastrophe claims adjusters Jason Brugh and Jeromy Harding spent much of the following week after Hurricane Michael struck, surveying the damage from ground zero at Mexico Beach, Florida to the Alabama-Georgia state lines. 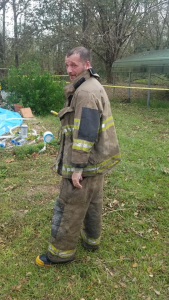 They also spent several days in service to local communities, helping clear downed trees from roads and people’s property, re-righting travel trailers, and in one case, putting out a fully-involved house fire. Both had building construction backgrounds prior to becoming insurance agents and claims adjusters. 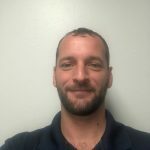 Brugh, of Catalyst Insurance Management in New Port Richey said he and Harding saw total destruction in their travels in the panhandle, with nearly every structure suffering damage. 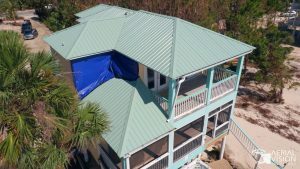 Their inspections revealed that standing seam metal roofs performed very well in the hurricane, while gable and three cap shingles were often completely gone. “FBC 110 mph-rated shingles came off like you’re peeling Post-It notes off a Post-It pad,” Brugh said on the podcast. 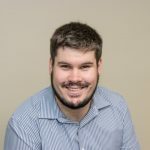 “We did see improperly installed metal roofs, where they were installed over existing shingles, allowing for an air gap between the two roof surfaces and those roofs were totally devastated. 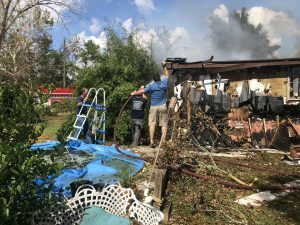 Those peeled the roof decking off like a beer can.” He added that the only damage he saw to properly installed metal roofs was impact-related. 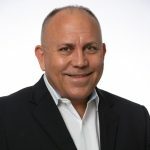 Jay Neal, President and CEO of the Florida Association for Insurance Reform (FAIR), said Hurricane Michael is further proof that Florida needs to adopt the tougher Miami-Dade building code statewide. “There’s no logic in having one higher standard for Miami-Dade County and not having it for the rest of the state,” he said. Neal and FAIR are pushing the Florida legislature to provide more funding for mitigation of existing structures; and to make homeowners more aware, too, of the difference installing impact-resistant windows and enhancing roof connections to walls can have on their home surviving the next hurricane. “We spend about 15-cents per Florida resident giving cities, counties, and nonprofits the funds to spend on mitigation and that’s got to change,” Neal said. He cited FEMA statistics that shows for every $1 invested in mitigation, $6 in damages are avoided. It’s an issue FAIR will be presenting to the 2019 legislature. Host Lisa Miller, a former deputy insurance commissioner, said there’s concern that a tougher statewide building code would increase the price of homes in areas like the panhandle, whose residents are predominantly lower income and couldn’t afford it. Brugh pointed out that Florida’s wind mitigation credit program provides tremendous savings for homeowners in both shoring-up existing roofs and installing new ones. Just mitigating a home’s existing roof with hurricane clips can provide an 18% savings on the wind portion of an insurance premium. Installing a new shingled roof can result in 13%-16% savings. He noted that decking would have to be re-nailed, which is another 13%-15% savings. The wind portion of a premium can be 70%-80% of a homeowner’s insurance costs annually. Host Miller noted that because most of the building stock in the panhandle is older, it’s more severely damaged than it might be otherwise and as a result, will drive-up claims costs. Industry analysts expect Florida insurance companies should be able to cover all claims. Reinsurance programs will cover those insurance companies’ bills. “Today’s program was certainly an education and a great example of where the ‘rubber’ of public policy really meets the ‘road.’ And how the decisions we make today, will affect millions of Floridians in the future and billions of dollars in insured property value, as we weigh the costs and benefits of policy change – in this case, building codes and mitigation techniques,” Miller said. So what do you think? Does Florida need even tougher building codes? And what lessons should we take away from Hurricane Michael when we rebuild what was damaged and destroyed? 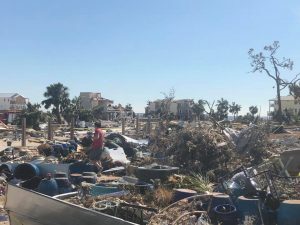 Click here to view more pictures of Hurricane Michael’s destruction and Lisa, Jason, and Jeromy’s travels through the panhandle in the storm’s aftermath.